Interested in getting involved? Applying for a leadership position? Involvement Ambassadors are here to help. 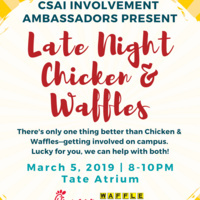 Come out to for late night chicken and waffles*. *Free chicken and waffles from Chick-fil-A and Waffle House for activity fee-paying UGA students with valid UGACard.